From the depths of pestilence, a new horror emerges. Become the exalted master of blight with Nidus Phryke. This Deluxe Skin transforms as Nidus gains Mutation stacks. Tear through the still-beating heart of your foes. Bestow this eye-opening Skin to any Claw Weapon. The signature Syandana of Nidus Phryke. Nidus Phryke’s loyal beast. * This works on all Kubrow breeds! Adorn any Kubrow or Helminth Charger Pet with a battery of gothic spikes. Everything you need to become the ultimate terror. 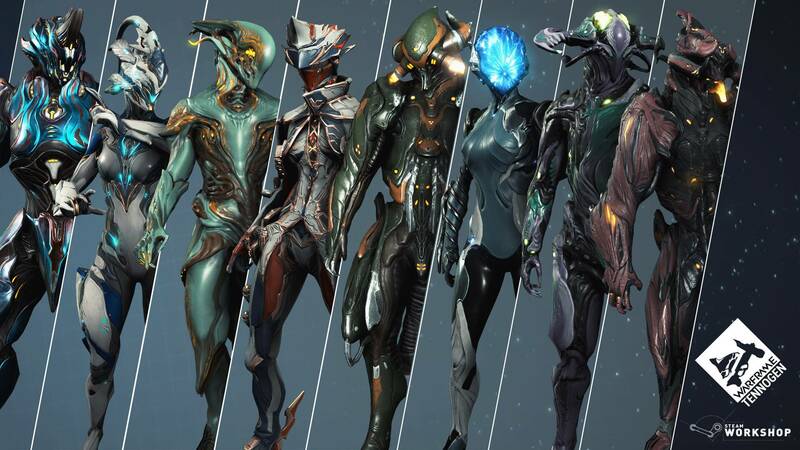 Includes the unholy Nidus Phryke Skin, Deimos Claw Skin, Nosos Syandana, Helminth Charger Metus Skin and Metus Kubrow Armor. The remaining Round 12 items are finally here! 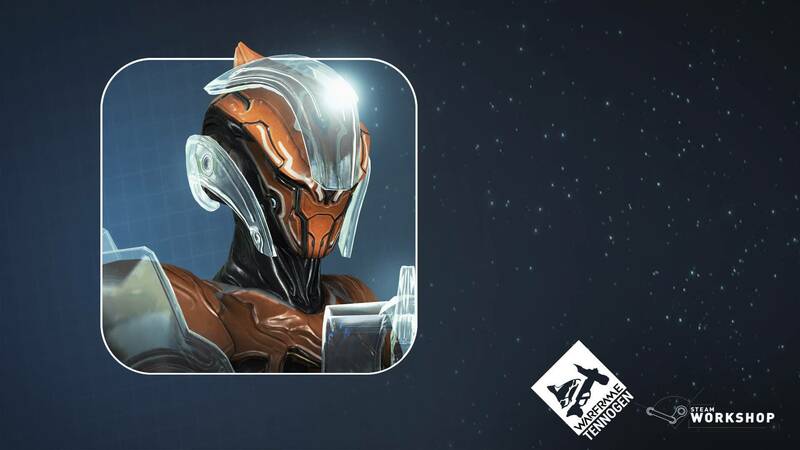 Meaning the bundles you see below complete the TennoGen Round 12 release on console. We hope you enjoy the amazing talent and creativity from this round's creators! Loki Erebus Skin by Vulbjorn, the graphical walrus. Note on TennoGen Round 13: It is very likely that TennoGen Round 13 will be split into separate releases (similar to what happened with TennoGen Round 12) in future updates due to content Cert deadlines. We will keep you up to date as we have more information to share! Nidus has 60% chance of generating an additional Mutation stack whenever he gains one, while standing in the Ravenous infestation. Allies in range take 40% less damage while channeling Thurible and grant 0.5 additional Energy charge whenever damaged. Allows for two simultaneous Mallets, each with 50% reduced range. Dashwire grants allies 100% Critical Damage. Cloak arrow has a 100% chance to prevent Status Effects. Visit the respective Syndicate Offerings for these new Warframe Augments! The Sacrifice is now replayable! 2 new original quest songs have been added to the Somachord from the Sacrifice soundtrack. You can find and scan the Fragments by re-playing the quest! These Somachord Fragments must be scanned in mission order from beginning to end in order to collect them all. If you miss one in mission 3 (for example) you can replay the quest and begin your search at mission 3 instead of back at mission 1. All Mandachord songs (other than the default song) will now appear in the Somachord, between the unlocked tracks and the locked tracks. Each song will play for 10 loops = 80 seconds. Added per-song autoplay toggle to the Somachord. Using the right trigger on a song will toggle eligibility for autoplay. Songs with autoplay disabled can still be played manually, and through the historical prev/next song toggles (going backwards always plays the previously played songs, and going forward after doing that will do the same until a new song is selected). Mandachord tunes now duck out other music in the Market and Star Chart. After watching far too many people struggle (and reading many feedback threads) with the crafting of an Incubator Core in the 'Howl of the Kubrow' quest, we are making it easier! We now give 'Incubator Cores' as a reward for completing the Earth > Mars Junction. Anyone who has completed Howl of the Kubrow will receive one on login automatically. Cetus Star Chart node will now always glow blue until the player has completed their first Bounty. Orokin Cells pickups will now appear in the pop-up notification similar to Argon Crystals. ‘Damaged Mods’ are now called ‘Flawed Mods’. Increase Fissure enemy spawn rate for Fissure Sabotage missions. Sortie Interception missions now only require 2 rounds instead of 3. Kavats are now included in the description for DNA Stabilizers in the market. Corrected an issue which caused particle systems to create excessive collision effects. Tweaked unicode filtering for private channels so you can play in English but still chat in Swedish with your Clan! Improved the Rift Walker Prime Sigil to be more metallic. This is the start of our Art team going through previous Prime Sigils to give them the same metallic treatment by request! Tweaked the Rhino Graxx Skin to more accurately match the Steam Workshop images. Updated the Vitruvian Glyph bundle store icon to better display the Glyphs. Adjust offset for the Zaikhya Syandana on Titania to try and reduce clipping with her wings. Adjusted the extreme color corrections on the Corpus Outpost. Made minor optimizations to Carrier's Looter precept. Made optimizations to Djinn's Fatal Attraction precept. Fixed a performance issue with multiple Sentinel attack Precepts. Optimized Helios's Detect Vulnerability Precept. Optimized performance of GPU particles in various cases. Optimized performance of many companion precepts. Optimized HUD performance slightly for several mission types. D-Pad navigation will now always be enabled for Chat when its expanded. Fixed an issue with being unable to use the D-pad on setting sliders. Fixed being unable to move cursors up to equip landing craft with the D-pad. Fixed the Search window remaining active after backing out of the Arsenal Equip screen with the D-Pad. Fixed the UI overlapping when switching from a Warframe without an Exalted weapon to one with an Exalted weapon. Fixed the pause Menu not closing when Menu is already open. Fixed a crash when attempting to move the text cursor vertically through a multi-line text box (MOTD for example). Fixed odd multi-line text navigation with up/down arrows for empty lines. Fixed a case where the Owned checkmark on the UI wouldn't be visible, even if you owned 1+ of the item. Fixed the red circle UI in Hive missions not accurately reflecting Hive search area around current Hive. Fixed hovering over a Syndicate Sigil does not show the +% gain. Fixed button to use Cinematic Mode in Captura not functioning. Fixed Chat hotkey not functioning as the Operator in the Orbiter. Fixed button to reset Captura settings to default not functioning. Fixed navigation logic that can cause the cursor to skip elements in diegetic screens, such as pressing UP while in the Inbox navigating to the squad overlay instead of the above Inbox message. Fixed virtual cursor not saving its position when browsing between ‘Browse Wares’ and ‘Today's Special’ for Cetus vendors. Fixed inability to select a tab for the first time if the virtual cursor is already on one when first opening a station (Foundry, Mod Station, etc). Fixed an issue where the Simulacrum 'kill enemies' command is unavailable. Fixed an issue with the virtual cursor being unable to select chat links unless you move the cursor off and on again. Fixed being unable to put items on your Wishlist in the Market. Fixed an issue where you could not purchase an item with the cursor on the purchase button. Fixed being unable to select and begin the advanced movement tutorial. Fixed being unable to Gift UI themes that you have purchased. Fixed being unable to see your Platinum total in Darvo's Market in the Relay. Fixed an issue where the virtual cursor would get its position reset on certain screens. Fixed purchasing a Relic Pack from Teshin resulting in the cursor to remain on screen upon closing the Offerings menu. Fixed the Iliac Syandana not playing nicely with Umbra’s scarf. Toned down eyebrow animations after you return to the Orbiter after the first memory sequence cinematic. Fixed The Sacrifice quest progression stopper if you didn’t have a melee weapon equipped in the ‘Pursuing Umbra’ phase. Fixed Octavia’s Mallet causing a progression stopping issue in The Sacrifice. Fixed the Dax Portrait not snapping properly to walls like a good portrait should. Fixed some of Umbra’s attachments appearing to float away from his body. Fixed the Umbra Operator Hooded Scarf not working with Transference FX. Fixed the new Umbra Operator Earrings showing the loop hanging below the earlobe instead of through them. Fixed wonky clipping with Sugratras and the Umbra Nikana. Fixed not being able to purchase the Excalibur Umbra Glyph. Further adjustments to the Umbra Operator Earrings appearing unattached. Improved speed of camera during memory sequences. Fixed an issue where starting 'The Sacrifice' Quest could lead to permanent white screens if Clients were aboard the ship. Fixed an issue where you could confuse 'The Sacrifice' Umbra if replaying the quest with an Umbra. Removed the lore/Somachord Fragments spawning in the last mission of The Sacrifice quest. Items/resources dropped by Sentient in The Sacrifice quest have been removed. This follows precedent with other Sentient spawning related quests. Fixed Umbra Courtyard Captura Scene lacking help text. Fixed the Sentinel 'Medi-Ray' Mod not working with Umbra. Fixed Magus Nourish not working with Umbra. Fixed Umbra losing Armor in Infested Salvage missions when he shouldn't. Fixed an effect on Gara that was causing a memory leak under certain circumstances. Fixed a hitch when switching config slots. Fixes towards a hitch when loading Mods with special FX, meshes, etc. Fixed crash that could occur if you died right while Ivara was drawing back an Arrow. Fixed a crash when reviving underwater or in Archwing. Fixed various game crashes and hangs particularly for long-running missions. Fixed a game freeze that could occur when changing appearances. Fixed new players who picked Excalibur not receiving his Exalted Blade in the Arsenal, making it unModdable. Affected players will now see the intended Exalted Blade Arsenal slot. Fixed Exalted melee Abilities causing Clients to hold their melee and primary/secondary weapons in hand if the Ability is terminated while still pulling the weapon out (e.g. Onslaught Conduits, out of bounds areas, etc). 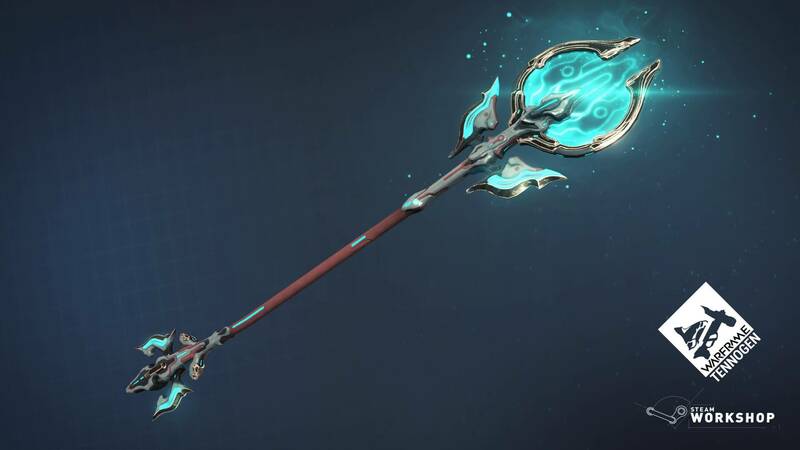 Fixed using a Warframe with an Exalted Melee weapon (Excalibur, Wukong or Valkyr), certain actions will lead to a weird "in-between" state, where your Exalted Melee Stance incorporates moves from your currently equipped melee weapon. Fixed an issue with the Life-Support VFX not disappearing in Survival Missions. Fixed the Pyrana Prime auto-switching to another weapon when the magazine empties. Fixed the Vala Sugatra Prime havinguntintable gold, it is now tintable! Fixed casting Khora's Strangledome on a large group of enemies resulting in the VFX disappearing shortly after. Fixed the Dax Syandana not being Giftable. Fixed lights at the top of the Dax Syandana not applying Energy colors. Fixed the Zarr Towsun Skin not properly apply to the "dangles" on the front of the weapon. Fixed inability to Chat link the Towsun Weapon Skins for the Quartakk and Stubba. Fixed an issue with the Hystrix not being able to switch fire modes during reload if all bullets are emptied out of the clip. Fixed enabling ‘Look at Character’ in Captura while playing through Advanced Camera positions causing the camera to shake. Fixed the Pandero Secondary Fire Codex/Arsenal description saying ‘Charged Shot’ when it is actually a ‘Burst Shot’. Fixed Somachord playing music while viewing some intro quest cinematics. Fixed Equinox’s cloth appearing as gray patches while in the Star Chart. Fixed Warframe Articulas displaying weapons that are meant to be hidden on holster. Fixed Fang Prime and Dual Ether having the incorrect Mastery Rank requirement. Fixed being able to skip the Granmu Prism cooldown by switching to and from a Scanner. Fixed issues with Fishing hitboxes not always matching their model. Fixed an issue with the Day 950 Login Tribute. Fixed issues where Zephyr could get stuck in bad animations. Fixed an issue where trading an MR locked item could lock the screen. Fixed an issue with Clients seeing violent shakes in the Jordas Golem boss fight. Fixed an issue with the Prisma Skana having incorrect properties. Fixed an issue with Clients not seeing Synthesis Target waypoints. Fixed an issue with being unable to mine on the Plains of Eidolon after a Host migration. Fixed an issue with the Sentinel 'SpareParts' Mod not working. Fixed an issue where Clients would not see Djinn's Reawaken icon. Fixed an issue where Ivara's Artemis Bow was not properly consuming energy. Fixed an issue with the Juggernaut Behemoth not using all of his moves. Fixed inconsistencies with the state of Lua in the Plains of Eidolon skybox. Fixed an issue where attempting to sell a ranked Arcane enhancement through your inventory would fail. Fixed a case where you could permanently lose the ability to cast Warframe abilities. Fixed enemies not being visible for Clients if they were in a ragdoll state for the Host. Fixed an edge case where Clients could auto-fail Onslaught if they joined in-progress. Fixed Energy values being mismatched between Client and Host when switching to and from Archwing. This usually resulted in Clients having a lower Energy amount than they should until they used an ability. Also fixes sometimes continuously attempting and failing to use energy pickups on Client. Fixed a possible game freeze that could occur if an ineligible player joins a squad (e.g. someone joins your Sortie session without a rank 30 Warframe). Fixed an issue where Nakak's mask dioramas would not show the masks properly. Fixed previewing Nakak's masks causing player's hood open/close customization to be forced to closed. Fixed Nakak’s masks reflecting your chosen Operator Energy color. Fixed previewing Nakak's masks defaulting your Operators Somatic colours. Fixed an audio issue with the Quartakk becoming silent when rapid firing. Fixed having a floating Operator after spamming Transference while Operator is in the death animation. Fixed Liset doors re-playing the open sound when entering with Operator while Warframe is already standing there. Fixed scanning with the Operator not counting toward any progress for Daily Targets or otherwise. Fixed Operators not being able to use the Synthesis Scanner without a Sol Battery Widget. Fixed Operator Void Blast not respecting energy colour. Fixed an issue with Clients sometimes having invisible Operators. Further fixes towards issues with Operators using Synthesis Scanners. Fixed an issue with your Operator sliding out of the chair in the Orbiter. Fixed Transferring from a downed Operator to your Warframe in Submersible Archwing resulting in the camera breaking. Fixed using Transference while entering a teleport volume resulting in the screen turning fully black/white. Fixed max Energy displaying incorrectly when transitioning from Archwing mode as the Client. Fixed an issue where you may not be able to use fishing gear after the first toss. Fixed an issue with squadmates disappearing in the Simulacrum when accessing the Terminal. Fixed being able to hold 1 to charge Zephyr’s Tail Wind and cast Airburst before the charge animation starts, causing you to get stuck. Fixes towards Eidolon Lures hugging the ground and likely getting stuck at the smallest bumps. Fixed "Recent" tab in the Invite menu always displaying other players on "Menus" even when Offline. Fixed being unable to customize Ivara's Artemis Bow Arrows. Fixed an issue with the Inventory UI not showing the Argon Crystal decay timer. Fixed an issue where clients reviving before the 'mission complete' end-cinematic can lead to a loss of functionality for the host. Fixed an issue with Glyphs changing their texture scale after reloading. Fixed Spearfishing bait and dyes not floating in ponds or the ocean after a host migration. Fixed Ivara's companion setting off spy traps when Ivara herself has Prowl Augment activated. Fixed an issue where you could soft-lock the game in the Arsenal. Fixed an issue with the leaderboard not appearing in the custom obstacle course room for clients. Fixed an issue with some decorations’ rotation cylinder being too large. Fixed an issue with the camera getting detached from players when summoning an Archwing in the Plains. Fixed audio crackling when firing the Baza with Ivara's Prowl ability. Fixed an issue with the Scourge's throw sounds playing when Modding. Fixed an issue with negative crit Rivens leading to increased critical chance. Fixed an issue where Melee sorting by 'Usage' for Zaws wasn't reflecting profile stats. Fixed an issue where some Eximus enemies appear pitch black. Fixed an issue where some pressure plates do not function in the Void. Fixed an issue where the ice bubble created by Arctic Eximus does not match the visual effect. Fixed the Celestia Syandana not having energy when previewed. Fixed a visual bug with the Tysis' dangles getting tangled. Fixed multiple issues with improper FX and models in the Codex Dioramas. Fixed an issue where the Stalker could get stuck in walls in certain levels. Fixed a visual bug with Standing when viewing progress. Fixed the Dual Dagger Should Holster market item not having a proper preview. Fixed issues with layering in the Captura scene selection. Fixed bad Bow clipping on Warframe Articulas. Fixed issues with certain TennoGen Syandana Offsets. Fixed Rift Walker Prime Sigil flickering in the Arsenal. Fixed Prisma Shade removing cosmetics. Fixed camera sometimes clipping through the Arsenal. Fixed multiple issues with flickering objects across multiple levels. Fixed level issues in the Sealab tileset. Fixed level issues in the Europa tileset. Fixed various navigation issues in the Corpus Ice Planet tileset (Europa). Fixed a level issue in the Corpus Ice Planet tileset (Europa). Fixed a script error when casting numerous Warframe abilities. Fixed Obsidian Corvus Syandana and Nikana Obsidian Skin from the new Obsidian Corvus Pack appearing as filepaths in your Arsenal. Fixed Host migration after killing an Acolyte sometimes causing the Acolyte to spawn again. Fixed an issue with negative Mod capacity when swapping in and out of the modding screen.